LIBERTYAIR provides professional maintenance on light commercial HVAC systems in Gainesville and across North Central Florida. Our technicians are licensed and certified so that we can provide the highest quality of planned maintenance in addition to our accomplished customer service. Whether you’re a business owner or property manager, call LIBERTYAIR for all of your light commercial HVAC maintenance needs. We also provide emergency services so your business can keep running even when your HVAC systems stops. Keep your business cool with our planned maintenance services. We understand that the majority of business owners are focused on the bottom line. But in Florida, you can’t afford to have your air conditioner stop working. Not only can this place additional stress on your workforce, but your consumers will be extremely uncomfortable while visiting your office, restaurant or bank. Don’t let the lack of heat or air conditioning affect your profits. Instead, contact LIBERTYAIR for regular planned maintenance on your building’s heating, ventilation and air conditioning system. Commercial HVAC systems are relied upon more heavily than in-home systems. Some systems are even controlled remotely by corporation headquarters, leaving the air conditioning running day and night. Offices for doctors, dentists and other healthcare providers are often kept a cooler temperature than a typical home for the comfort of patients. Other businesses are often sought as a refuge to escape Florida’s cruel summer heat. Consumers often linger in supermarkets, movie theaters, restaurants and more during heat waves in order to stay cool. Don’t disappoint your consumers on the hottest of days by having your air conditioner break. Some basic planned maintenance performed on light commercial HVAC systems can extend the life of the system as well as improve the air quality of your business. At LIBERTYAIR, we provide basic system cleaning to clear heaters and air conditioners of dust, grease and other debris that can build up over time. We also inspect your ductwork to remove obstructions and clean out pollen, dust, allergens and other particles. This type of regular maintenance doesn’t take much, but the effects are often noticed by consumers. If your employees and customers are sneezing a lot, if the airflow of your HVAC system has weakened, or if the air is not heating or cooling to previous temperatures, it’s time to call LIBERTYAIR. Commercial buildings can have thousands of visitors in just a month or two. When you add the number of employees, friends and family members who visit, you can begin to see how the quality of the air can affect a lot of people. As the majority of people in Florida spend most of their time indoors, it can be alarming to learn that indoor air quality is often more polluted than outdoor air quality. Pet dander, dust, pollen, allergens, smoke, odors and other particles can fill the extensive ductwork of the building where your business is located. The pollutants lower the quality of air and place an unnecessary strain on the heating and cooling system. 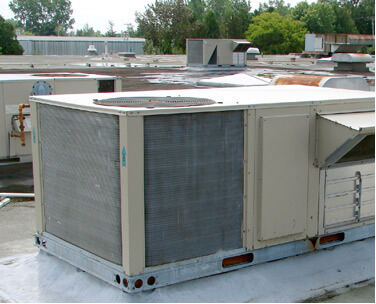 Without planned maintenance, you may be replacing the HVAC system on which your business relies 5-10 years too soon! That’s a tremendous financial burden that you can easily avoid by calling LIBERTYAIR. Let us improve the environment of your business with thorough light commercial HVAC maintenance.